Owego, N.Y. - Natalie Mattrazzo, owner of The Farmhouse Brewery and Malthouse in Tioga County, N.Y., has been invited to join the New York State Craft Brewer Workgroup. According to a press release from the New York State Governor&apos;s Office, this group resulted from the 2nd Wine, Beer, Spirits and Cider Summit, and the purpose of the group is to deliver recommendations on furthering the growth of the state&apos;s craft beer industry. Mattrazzo is one member out of just 12 that were chosen from the growing pool of industry professionals, including operators of the other 100 microbreweries in New York State. The workgroup will also include the Commissioner of the State Department of Agriculture and Markets, Richard Ball, and other representatives from the NYS Liquor Authority and Empire State Development. Cold Spring, N.Y. - There is plenty happening under the Tent at the Hudson Valley Shakespeare Festival this summer, and starting August 8, there will be even more HVSF to enjoy when HVSF2 (formerly known as In Process) gets under way at The Depot Theater in Garrison. Now in its fifth season, this exciting series explores new plays in a lab setting with HVSF company members in readings of contemporary work. All tickets for HVSF2 are $25 and may be purchased at http://philipstowndepottheatre.org. The Philipstown Depot Theatre is located at the Garrison Train Station, 4 miles from the Bear Mountain Bridge off Route 9D, Garrison&apos;s Landing. Bolshoi Ballet Master Class- TONIGHT @ 6 P.M.
Saratoga Springs, N.Y. - Russia&apos;s legendary Bolshoi Ballet, the largest ballet company in the world and one of the most prestigious, debuts at Saratoga Performing Arts Center on Tuesday, July 29 - Friday, August 1. The Bolshoi Ballet, accompanied by the Bolshoi Orchestra, will present four performances of its signature production of Don Quixote. The SPAC engagement is one of just three US locations on the Bolshoi&apos;s 2014 tour; the company performed to sold-out audiences in May at the Kennedy Center in Washington, D.C. and most recently, at the Lincoln Center Festival in New York City. Performances kick off on Tuesday, July 29 with Bolshoi principal dancers Maria Alexandrova and Vladislav Lantratov dancing in the lead roles of "Kitri," and "Basilio." Opening Night will also feature an audience-wide sparkling toast, Russian vodka tastings, and a fireworks finale. in promoting the area to visitors on Friday, July 25, 2014 at the Holiday Inn Johnstown-Gloversville. Gina DaBiere-Gibbs, Fulton County&apos;s Director of Tourism said, "I&apos;m grateful to the community for their support of our tourism program and am pleased with the attendance during the evening&apos;s festivities. 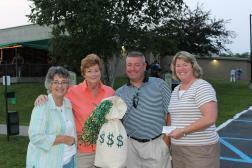 We are fortunate to have held this raffle for 20 years and to still have the continued support each year." Flushing, N.Y. - The New York Mets announced Irish Heritage Night will take place this Friday, August 1 at Citi Field when the Mets host the San Francisco Giants at 7:10 p.m. Dubbed by Jimmy Fallon as "New York City&apos;s house band for the last 30 years," Black 47 will perform on the Mets Plaza, located outside the Jackie Robinson Rotunda, beginning at 6:00 p.m. as part of their farewell tour. Fans will be entertained by on field pre-game performances beginning around 6:30 p.m. by Irish Step Dancers as well as in-game programming that celebrates Irish culture. Wassaic, N.Y. - The Wassaic Project, an artist-run multidisciplinary arts organization in its seventh year, is proud to announce its 2014 film festival selections, which highlights the best contemporary emerging filmmakers in international and American independent cinema. New to the festival this year is a first of its kind partnership with Short of the Week as well as a surprise Midnight Movie. Located in the Maxon Mills, Luther Barn and sprawling fields of the hamlet of Wassaic, New York, The Wassaic Project Summer Festival - a FREE multi-disciplinary celebration of art, music, film, dance, food, and community will take place from August 1-3, 2014. Syracuse, N.Y. - Ten of Destiny USA&apos;s restaurants are holding a Dine-Out from Friday, August 1 to Saturday, August 9, as part of Destiny USA&apos;s two-year anniversary celebration. Each venue will offer a three-course meal for $25 per person. Check with the individual establishments for their menus and offers provided during the meal. Greene County, N.Y. - For more than 300 miles, the Hudson River winds through New York State, curving along the shores of the Great Northern Catskills of Greene County to offer easy access to historic sites, nature preserves and riverside dining. This summer, set sail along the Hudson River and explore Greene County&apos;s vibrant shoreline via the Catskill Creek to enjoy the best of the Catskill&apos;s waterfront. LAKE PLACID, N.Y. - As summer begins in New York&apos;s Adirondacks, committee members of one of the Northeast&apos;s top holiday festivals are already getting into the spirit - yes, in July. The Lake Placid Holiday Village Stroll slated for the weekend of December 12 - 14, celebrates its 7th year in 2014 - and this small-town festival will return with several new additions and special events.